Food was flavorful and fresh. Service was excellent. Good variety on the menu and staff was great at answering all my questions about each of the dishes I was interested in. Thank you for the rating! We are glad you enjoyed your meal and that our staff was helpful in helping navigate the menu. It was a pleasure having you and we hope to see you again soon! Food was very favorable and fresh. Loved the tea salad! Great food in a convenient location. Service a little slow, but it was a Friday night. Thank you for the feedback! 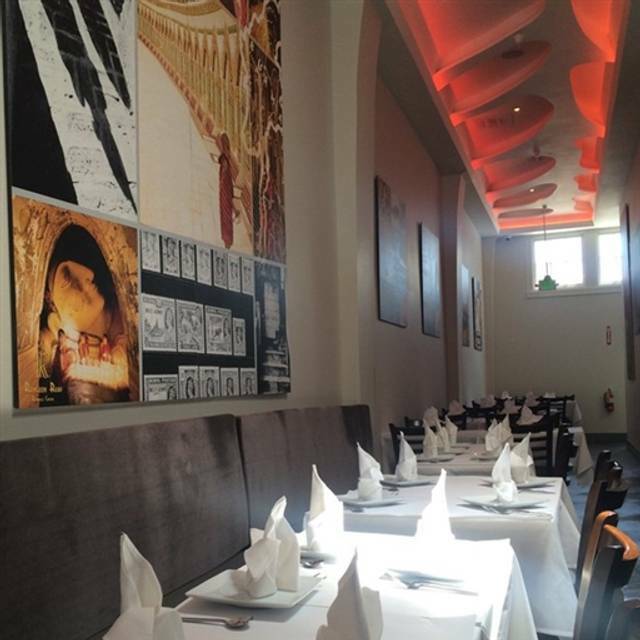 We are glad to hear that you enjoyed the food and will definitely look into our service that night with our team. It was great to have you and we appreciate hearing from you. Take care! Hope to see you again soon. Fantastic food, as always. However, the ambiance is a significant downgrade from the Palo Alto branch. Thank you for the feedback, Luke! It's super helpful and essential to making the right improvements on our end. The continued visits are greatly appreciated. Looking forward to seeing you again! As always, take care. Ordered tea leaf salad, Ruby Rainbow Salad and Samosa Soup. The tea leaf salad was good, though it tends to be oversold. The proportion of fermented tea leaf seemed on the lower side. Loved the Ruby Rainbow. Samosa Soup was a dud, would avoid it again (though it did get better as a left-over). Anaamika, it was truly a pleasure having you in! We appreciate the feedback about our Tea Leaf Salad and Samosa Soup and will address it with our team. Otherwise, we thank you for sharing and for joining us! Take care. Good, but not great. Rice was old I think. Hard. I got the feeling it was left over. Asked for new rice and they got it. Split the one bowl they produced with my lunch partner. They didn't replace the other bowl of rice. Numerous refills on the soda, so some aspect of service is great. Food a bit on the oily side, but very tasty. I would go back, but not rushing. Great food! Try the tea leaf salad! The waiters were attentive and friendly. Generous portions. Nice interior. We are going back as soon as we can. Outstanding. Excited to find quality Burmese on the northern peninsula. So good we came back twice in one week! I love the modern interior and bar space is impressive. The food is out of this world! Burmese chicken salad is the best!!! Also tried the Mango chicken and fiery tofu vegetables. Delicious! The Burmese iced tea is so good! Nice surprise. Good food. I enjoyed the restaurant and would recommend. It was our first time here and the food was good. We would come back. It's great for everyday dining, or a quick bite. Had a nice experience and the food was delicious, however, when we came in the place was nearly empty, but for some reason we got all our food at once, appetizers, soup, and all our entrees. We felt rushed, and there was no reason for that. Restaurants need to give people time to eat each course before bringing the next. Servers were friendly and efficient, but timing could have been improved. I arrived early and decided to have a glass of wine at the bar, and when my date arrived we stayed at the bar for lunch. The bartender was wonderful. We talked wines for a while and the waitress was very nice and helpful with recommendations. Food was amazing. Great service, the ambiance was quaint, and I loved that my date and I could have a conversation without raising our voices. All in all a wonderful experience. The bar is impressive and cocktails are yummy! Excellent food and service. Highly recommended for fun and business meals. Busy but not too noisy. Great service. I loved the Tea Leaf Salad! What a very welcoming place! The staff could not have been sweeter and sincerely interested in our enjoyment of the food and wine...which we did enjoy very much! 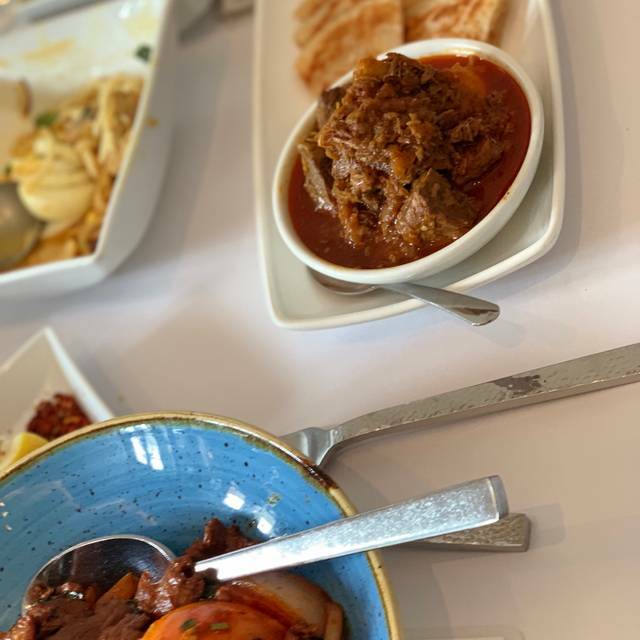 Burmese cuisine is very special and fairly rare to find so was super pleased to share this with an old friend I had not seen in a very long time so she could enjoy this cuisine for the first time. Thank you!! The restaurant was very quiet when four of us went there for lunch. I like the decor and the attentive services. 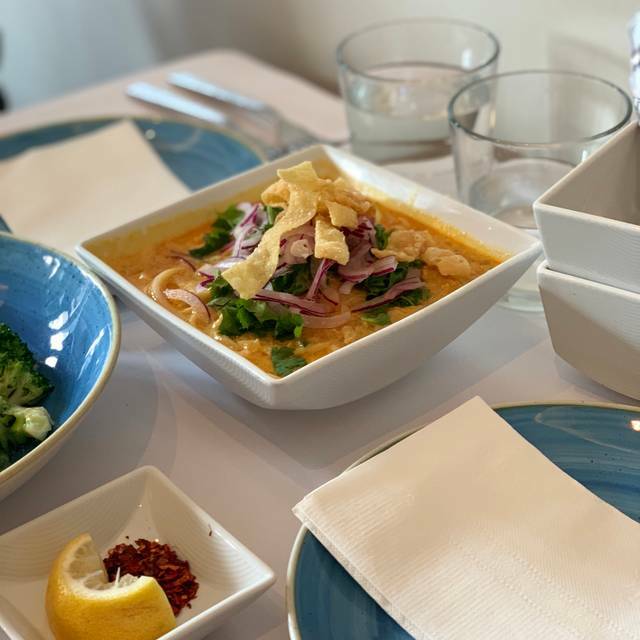 If you are are looking for authentic Burmese cuisine, this is not the place; if enjoy Burmese food with an American twist, you will be satisfied with the beautiful plating and good food at very reasonable prices. If I happen to be in the area during happy hours, I definitely will stop by to try their all you can eat appetizers for $5.00. Of course, drink is not included. Good Happy Hour but we then ordered 3 dishes and found all looked and tasted the same; good but boring. My wife used yelp to order their most popular - a Prawn dish $20 and Chicken Pad Thai but like Tomato Beef Chow Mein (w chick!) and a chicken dish was nice but looked & tasted like the other 2... If the waiter steered us to other dishes, maybe our experience wud be different? Too many good restaurants in Burlingame (same high prices) making it competitive. Not sure this place will make it during next downturn. Are other Ruby Rangoons around and better?? I took my wife here for our one-year wedding anniversary and we had a phenomenal time. The mood was so romantic. Our waitress was Sahara was very attentive and helpful throughout our entire meal. The staff presented us with a card and special gift along with dessert for our special occasion. The food and drink were so flavorful and authentic! We will definitely be coming back! The food is mediocre and expensive compared to other Burmese restaurants. Normally a huge fan of the green tea leaf salad, there's is ok and spicier than most. The service is great, but it is has never been busy when I've been there giving servers extra time to give you attention. They are also very quick to serve the food, so I always come here b/c I don't have to wait and can get in and out quickly! Awesome! Super friendly staff and great food! The food was good and so was the service. We’re there to celebrate birthday. They really had a special way to make the occasion fun. Everyone in our party enjoyed the dinner. The food recommendations and the service was excellent! We really enjoyed our outing! Had a last minute business-related dinner here. The ambiance was quiet, although I've been here when it wasn't so quiet. The food here is really great and I particularly like the garlic noodles. From appetizer through dessert, the service was quick, friendly and efficient. Parking was easy and the restaurant is located along a shopping district where other stores and shops are easily available so dinner is not the end of the evening. This restaurant goes on my favorites list. I think this is a company wide issue in management. Our 3rd waitress was good, not sure why we had 3. They ran out of small sparkling water bottles, all of the soda (machine wasn't working) and isn't tea leaf salad mixed together for more than 3 seconds and served? I spoke with the woman at the entrance, and let her know, in hopes this wouldn't happen to anyone else when they dine...but the response was "We'll take that into consideration." It did not seem like she cared or listened, so I will not visit again. 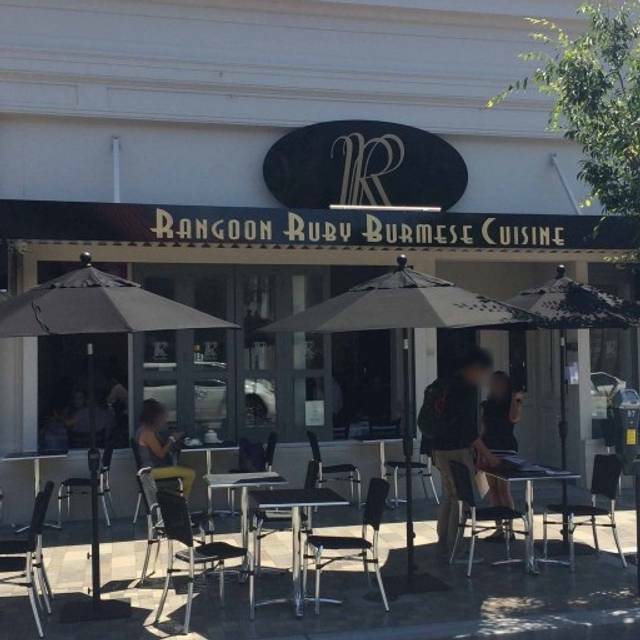 Nor will I give Rangoon Ruby any more of my business. If she was the least bit empathetic, I would give it another chance. Flavorful and innovative Burmese food on the new Burlingame Ave sidewalk in Burlingame. 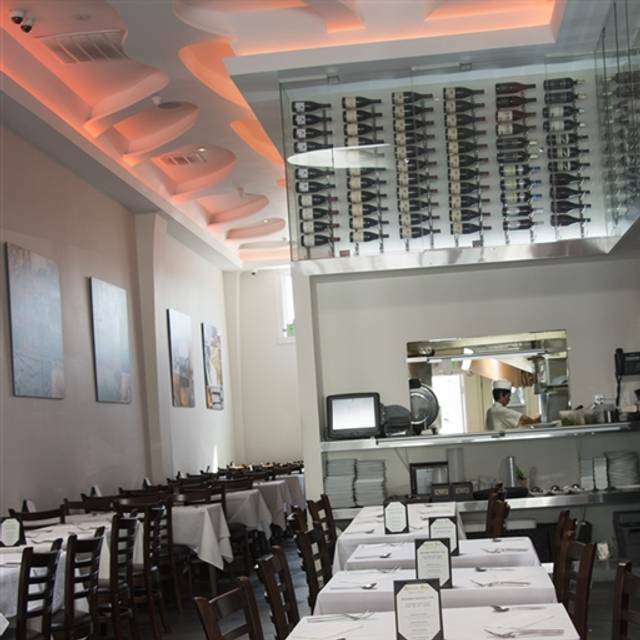 I've enjoyed the two locations in Palo Alto, so I knew that it would be good. My friend and I enjoyed both the samosa and leaf appetizers. We also loved the shrimp curry and the fiery tofu dish. Everything tasted great, and the service was just right. I frequent the Palo Alto location so I was surprise to find that the food isn't consistent at the Burlingame location. I found the food to be really "off" and mediocre at best. The same dishes that I found outstanding in Palo Alto were barely edible- even the coconut rice was wet and didn't taste good.